Y'all, I'm not going to beat around the bush here. 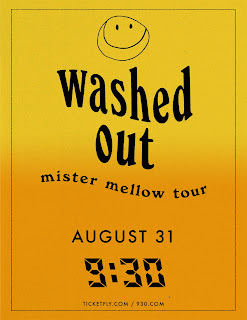 If you haven't seen Washed Out yet, you just plain need to. Having just released newest record Mister Mellow, Ernest Greene is hitting the road to blow some minds. One stop on the Mister Mellow Tour just so happens to be the 9:30 Club, and I just so happen to have a pair of tickets to give away. If you're wanting to get your hands on these tickets (and frankly, why wouldn't you?! ), just send me an email with your best pitch about why the tickets should be yours. Make it good. Fine print: Contest is for two (2) tickets to this show. Contest closes at noon Eastern on Tuesday, 8/29/17. Do me proud, my friends.